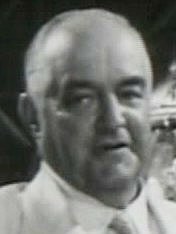 Sydney Hughes Greenstreet (27 December 1879 – 18 January 1954) was a British actor. While he did not work in films until the age of 61, he had a run of significant motion pictures in a Hollywood career lasting nearly a decade. Greenstreet is best remembered for his Warner Bros. films with Humphrey Bogart and Peter Lorre, which include The Maltese Falcon (1941), Casablanca (1942), and Passage to Marseille (1944). He became a naturalized United States citizen in 1925. Greenstreet portrayed Nero Wolfe on radio during 1950 and 1951. Greenstreet was born in Sandwich, Kent, the son of Ann (née Baker) and John Jarvis Greenstreet, a tanner. He had seven siblings. Greenstreet left home at the age of 18 to make his fortune as a Ceylon tea planter, but drought forced him out of business. He began managing a brewery, and to escape boredom, took acting lessons. Greenstreet's stage debut was as a murderer in a 1902 production of a Sherlock Holmes story at the Marina Theatre, Ramsgate, Kent. He toured Britain with Ben Greet's Shakespearean company, and in 1905, he made his New York City debut in Everyman. Thereafter, he appeared in such plays as a revival of As You Like It (1914). Greenstreet appeared in numerous plays in Britain and America, working through most of the 1930s with Alfred Lunt and Lynn Fontanne at the Theatre Guild. Throughout his stage career, his parts ranged from musical comedy to Shakespeare, and years of such versatile acting on two continents led to many offers to appear in films. He refused until he was 61. In 1941, Greenstreet began working for Warner Bros. His debut film role was as Kasper Gutman ("The Fat Man") co-starring with Humphrey Bogart in The Maltese Falcon. The film also featured Peter Lorre, as the twitchy Joel Cairo, a pairing that would prove durable. The two men appeared in some nine films altogether, including Casablanca (1942), with Greenstreet as crooked club owner Signor Ferrari (for which he received a salary of $3,750 per week for seven weeks), as well as Background to Danger (1943, with George Raft), Passage to Marseille (1944), reteaming him with Casablanca stars Bogart, Lorre, and Claude Rains, The Mask of Dimitrios (1944), The Conspirators (1944), with Hedy Lamarr and Paul Henreid, Hollywood Canteen (1944), Three Strangers (1946), and The Verdict (1946). In the last two in the list, and The Mask of Dimitrios, Greenstreet received top billing. The actor played roles both in dramatic films, such as William Makepeace Thackeray in Devotion (1946) and witty performances in screwball comedies, for instance Alexander Yardley in Christmas in Connecticut (1944). Near the end of his film career, Greenstreet played opposite Joan Crawford in Flamingo Road (1949). After little more than eight years, Greenstreet's film career ended with Malaya (also 1949), in which he was billed third, after Spencer Tracy and James Stewart. In those years, he worked with stars ranging from Clark Gable to Ava Gardner to Joan Crawford. Author Tennessee Williams wrote his one-act play The Last of My Solid Gold Watches with Greenstreet in mind, and dedicated it to him. During 1950–51, Greenstreet played Nero Wolfe on the NBC radio program, The New Adventures of Nero Wolfe, based loosely on the rotund detective genius created by Rex Stout. Greenstreet suffered from diabetes and Bright's disease, a kidney disorder. Five years after leaving films, Greenstreet died in 1954 in Hollywood due to complications from both conditions. He is interred at Forest Lawn Memorial Park, Glendale, California, in the Utility Columbarium area of the Great Mausoleum, inaccessible to the public. He was survived by his only child, John Ogden Greenstreet (30 September 1920 – 4 March 2004), from his marriage to Dorothy Marie Ogden. Actor Mark Greenstreet is a distant relative. ^ a b c d Donnelley, Paul (2003). Fade to Black: A Book of Movie Obituaries. Music Sales Group. p. 295. ISBN 9780711995123. Retrieved 1 April 2017. ^ Sydney Greenstreet's Petition for Naturalization, ancestry.com; accessed 6 October 2015. ^ Profile Archived 8 December 2015 at the Wayback Machine, focusfeatures.com; accessed 4 December 2015. ^ "Film Actor Sydney Greenstreet Dies". The Los Angeles Times. California, Los Angeles. January 20, 1954. p. 27. Retrieved September 2, 2018 – via Newspapers.com. 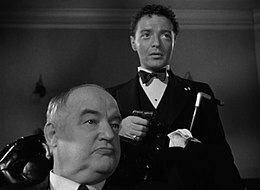 ^ "Sydney Greenstreet". Internet Broadway Database. The Broadway League. Archived from the original on 10 March 2018. Retrieved 2 September 2018. ^ Obituary, Variety, 27 January 1954, page 71. ^ "Swansea Grand Theatre Pantomime Archive". Retrieved 15 May 2017. Sculthorpe, Derek (2018). The Life and Times of Sydney Greenstreet. Bear Manor Media. ISBN 978-1-62933-308-3. Youngkin, Stephen D. (2005). The Lost One: A Life of Peter Lorre. University Press of Kentucky. ISBN 0-8131-2360-7. – Contains a chapter on the professional friendship between Greenstreet and Peter Lorre. Wikimedia Commons has media related to Sydney Greenstreet.